Much to the chagrin of Closet’s Faithful Bloglodytes, the site went on an unintentional hiatus at the start of 2011. 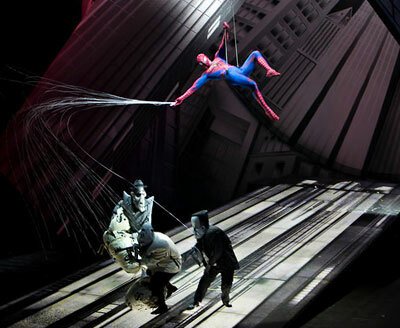 The final installment of 2010 concerned the announcement that the opening of Spider-Man: Turn Off the Dark, the much-maligned and technically-dangerous Broadway show, was delayed once again. I had reviewed the production a couple weeks before (see post) and took the news as an opportunity to share my beliefs as to how to fix the musical (see “Spider-Man: Turn Off the Dark Redux”). When the Web-Spinning Spectacle did open a few weeks ago, I was heartened by the news that many of my suggested changes had been implemented, and that the subsequent reviews of the revamped show have been overwhelmingly positive. Far be it for me to take credit for the musical’s successful return. After all, many of my criticisms and helpful hints echoed those of other reviewers. Besides, I’m cursed with an overpowering sense of modesty—no one does humility like me! But I did see Spider-Man: Turn Off the Dark’s triumphant opening as a sign for Yours Truly to reopen the Closet door, as it were. 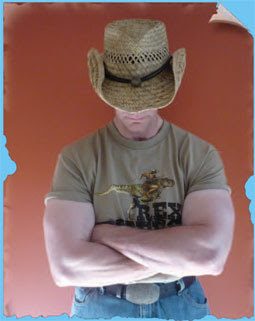 Fortunately, those forces that steered me clear of the blog have subsided enough for me to do so. Rex Riders was such a force; one to be reckoned with! Rex Riders is a Young Adult (YA) novel, which can best be described as Ray Harryhausen’s stop-motion classic, The Valley of the Gwangi, meets the young people’s western serial of the original Mickey Mouse Club, “Spin and Marty.” For those Faithful Bloglodytes too young to remember that Ronald Reagan was once a Hollywood movie star, switch the latter reference with Nickelodeon’s late-80’s/early 90’s teenage sitcom Hey Dude. 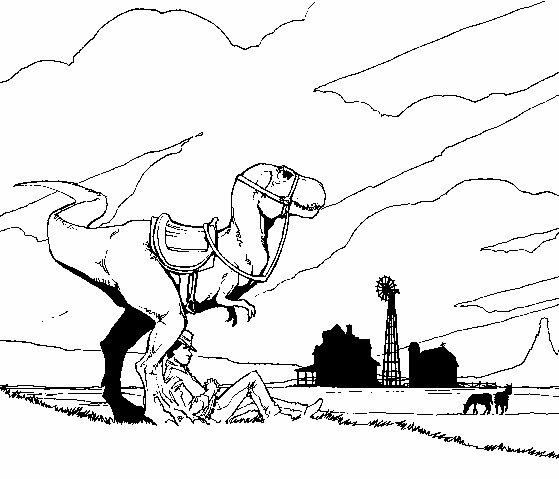 And if I’ve still left you scratching your head betwixt text messages, think Jurassic Park meets Cowboys and Aliens. 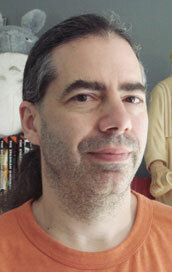 I’m the proud editor of the book, although I served in other capacities as well. My involvement on the project began in June 2010 at BookExpo America (BEA), the literary saturnalia for the publishing trade held annually at New York City’s Jacob Javits Center. Through my business relationship with Fanfare/Ponent Mon—publisher of translated graphic novels—I received a badge and attended. BEA is a book-lover’s dream. Publishers showcase their upcoming line of titles, many giving out galleys—advance unproofed copies—of certain ones about which they are particularly jazzed. Sure, I was excited to get free books, but it’s not like I’m starved for reading material. 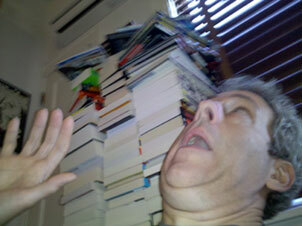 The towering to-be-read stacks in the library of Casa Vroom! 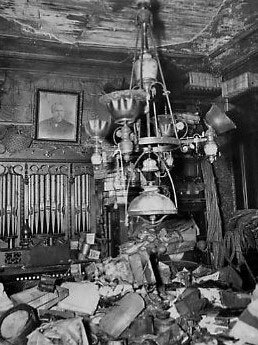 threaten to topple anytime a truck passes by, and I’m not especially enamored of suffering the same fate as Langley Collyer who perished under the weight of literally tons of ephemera that he and his brother hoarded in their home. My main objective was to network, and in so doing, I stumbled upon the Monstrosities, Inc. booth. Actually, lured would be a better verb to use. 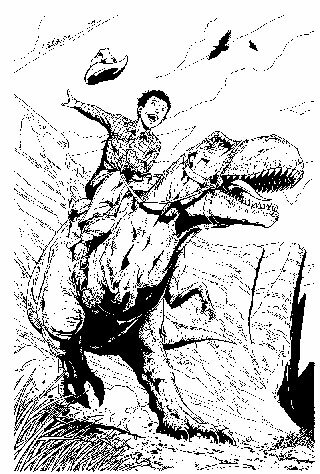 Rex Riders was wisely highlighted with giant reproductions of the artwork that lay within the book’s pages; beautifully rendered pen-and-ink illustrations of cowboys and dinosaurs that caught my attention like a dog to a squirrel. And there was no choker collar to prevent my charging the booth. There I met the creative genius behind the novel, J. P. Carlson. Carlson was immediately taken with my affection for his product. 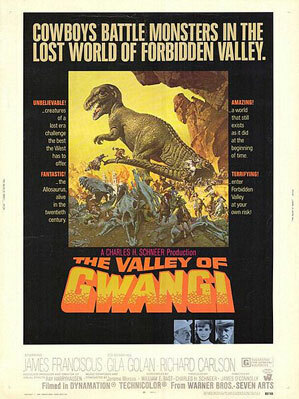 He was a fellow dino-phile, and it was love at first cite; that being my citing The Valley of the Gwangi when looking at the Rex Riders art. For the next half hour, Carlson and I geeked out over all things monstrous, from T-rex to Reptilicus, Gorgo to Godzilla, King Kong to King Ghidorah. Eventually, our conversation turned to the images surrounding us in the booth. 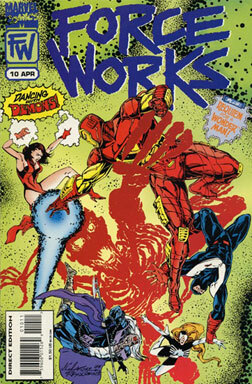 The art was familiar and I was pleasantly surprised that it was the work of comic book artist Jim Calafiore, whose penciling on the short-lived 90’s Marvel series, Force Works, was a favorite of mine. 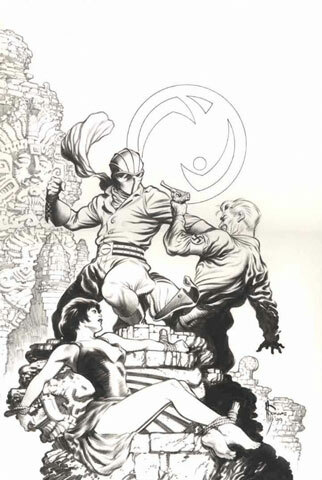 Calafiore’s work was refreshingly economic in an age when the Image Comics style of extreme detailing, cross-hatching, endless speed lines and flash-masquerading-as-storytelling had become the norm. That is not to say Calafiore’s style lacks such. He just knows how not to overwork the art, detailing just where needed and only in service to the storytelling. It was also nice to see that Calafiore hadn’t rested on his laurels in the fifteen years since Force Works. Many comic artists who find early achievement do nothing more to advance their craft thinking success precluded their having to do so. Thus, their work becomes stale, stagnating in a morass of been there/done that, and they soon find themselves no longer the “hot” property of comicdom. But it was evident that Calafiore strove to advance his art. There was a confidence and fearlessness not present in his earlier work. Just take a gander at the pieces featured in this post. There’s a simplicity that belies the rich detail and depth, creating an excitement and animated quality that raises Calafiore’s art above others. 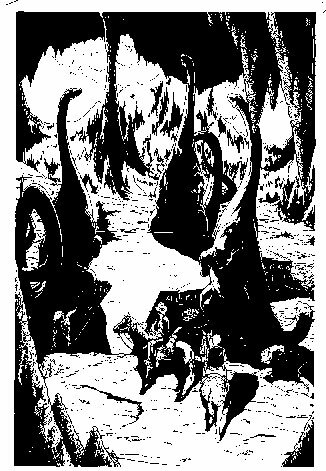 Carlson needn’t have explained the plot of his prehistory-meets-the-old-west adventure. 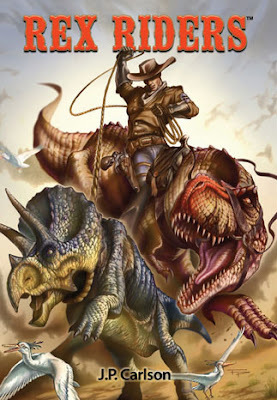 He had me at cowboys and dinosaurs. I had to get a copy of his book! But as a self-publisher Carlson only printed so many galleys, and he was understandably saving those for publishers, editors and industry people who could actually help him see Rex Riders into bookstores. Extensive my experience in the field may be, but I was still a lowly independent contractor seeking a Random House or HarperCollins to call my home. 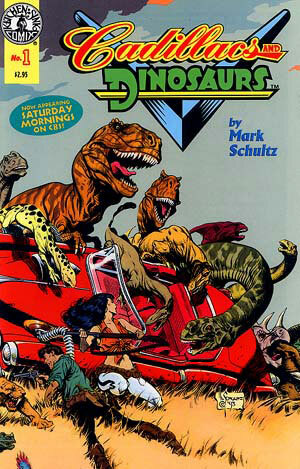 “You must also be familiar with Cadillacs and Dinosaurs?” I nonchalantly asked. 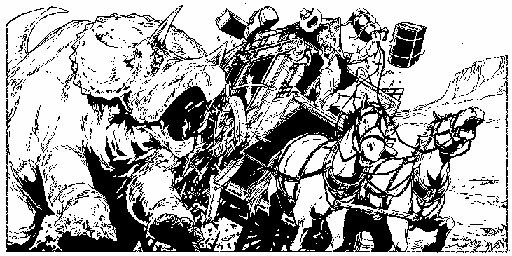 Cadillacs and Dinosaurs was a mid-80s comic book series by artist/writer Mark Schultz, a post-apocalyptic tale of modern man living on a future Earth populated by dinosaurs. Schultz’s work is reminiscent of the legendary comic strip and pulp artists of the 30s, such as Roy Krenkel, Burne Hogarth and Frank Frazetta. It’s breathtaking and some of the finest work being produced today. I knew damn well Carlson was more than acquainted with the series, and it was a sure bet he was a big fan of Schultz as well. 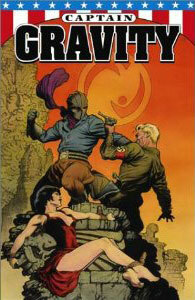 But I was certain Carlson would not know of the Schultz work that graces the first trade paperback of Captain Gravity, a character I created and for which I penned the initial origin and story arc for Penny Farthing Press in 1998. He didn’t, and it didn’t take long before he was as eager to read my book as I his. So we agreed to a trade: Rex Riders for Captain Gravity. The transaction was made that next day, and I was reading Carlson’s epic that evening. Rex Riders is a fantastical tale set in the old west at the turn of the century. It’s hero is fourteen-year-old Zeke Calhoun, who stumbles upon a fallen otherworldly rider, riddled with bullets, and his even more surprising “horse,” a juvenile Tyrannosaurus rex. 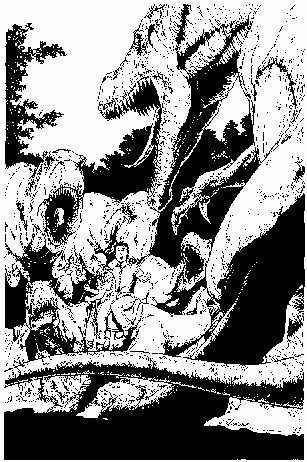 What Zeke doesn’t know is that rescuing the stranger would set off a chain of events that would plunge the teen into an incredible adventure, and lead to the discovery of a deadly alliance between Earth and a prehistoric world that could threaten the fabric of both! Young Adult novel it may be, but I found myself caught up in the saga. The characters were well-defined and interesting—the heroes heroic; the villains despicable. The pacing was excellent with each chapter ending on a cliffhanger which doesn’t feel contrived, but rather flows organically from the story. And Carlson blends a nice mix of excitement, suspense, mystery, horror and fun. Calafiore’s dazzling illustrations which top every chapter opening with interstitial full-page shots speckled throughout—including one spectacular piece that spans two folios—certainly don’t hurt the book’s enjoyment, either. I polished off the 400-page galley in a day. As promised, I shot Carlson an email telling him of my thoughts. I went on to mention the book’s massive potential, not only in print but all other forms of media and licensing. My one concern was the galley’s many typos and its typesetting, which was filled with widows—paragraphs that end atop the subsequent page using less than a third of the line’s width—orphans—words of less than four characters that sit by themselves at the completion of a paragraph—bad word breaks; chapter endings of less than four lines; i.e. the aesthetic qualities of the book that lend to a pleasurable reading experience. Advance uncorrected proofs are meant to emulate the finished product as closely as possible. True, a few typos will slip through and some typesetting will be overlooked with the intention of fixing the problems before the title sees print. But the galley should essentially be the book before fine tuning, not total restoration. 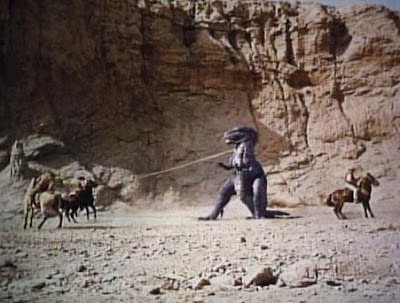 I loved Rex Riders and Carlson. I wanted both to succeed, and the nits I was picking would be the difference between an amateur job and a professional one. But I also apologized, pointing out that I was sure he knew all this and was already taking the necessary steps that would make Rex Riders shine. Carlson thanked me for my comments. He was aware of the book’s faults, but explained that Monstrosities was a company without an editor or typesetter, and then asked if I would I be interested in taking up the cause. Thus, I found myself in the enviable position of marshalling a great book and possibly wonderful series; what I feel could be the next big thing in YA novels. But don’t take my word for it. Check out these reviews from the distinguished Smithsonian magazine website and respected pulp and comic book writer (Green Hornet and Terminator) and historian Ron Fortier for the New York Journal of Books. Rex Riders is available now. It’s a great ride… er… read!